This internment camp had a population of 2636 and was located on leased ranch acreage in the interior of British Columbia. It was the most isolated of the internment camps since it was 14 miles east of the town of Hope. Since there was no village, street corners or shops, the only contact with the hakujins (occidentals) were the Security Commission employees, the Royal Canadian Mounted Police or the church workers ministering to the Tashme residents. Its solitary store was Commission operated where only coupons instead of cash were legal tender. 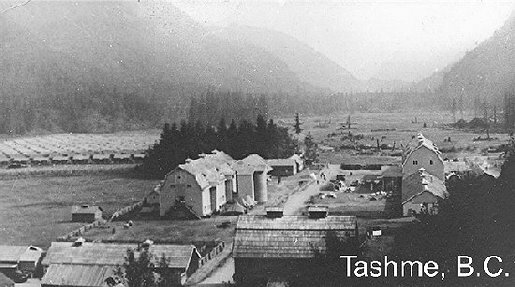 Of the six established camps under the Security Commission, Tashme was viewed as the best structured in terms of organization, chiefly because of its youth program. JCCC — 更新日 7月 20 2011 8:42 a.m.